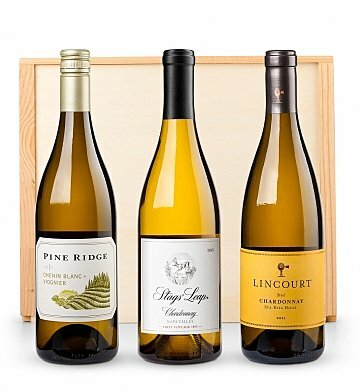 Three hand selected California whites - two Chardonnays and a Chenin Blanc - are ready to wow your recipient and perfectly pair with a chicken or seafood dinner. One bottle each of St Clement Napa Valley Chardonnay, Pine Ridge Chenin Blanc, and Lincourt Steel Chardonnay. For more information on this wine, please see the Tasting Notes. This trio of fine wine is presented in our durable wine crate. A complimentary card is included with your gift. Measures 14" x 12" x 4"
California White Wine Trio is a hand delivered gift. These gifts are delivered by one of our local design centers located throughout the United States and Canada. Same day delivery is available for most gifts when ordered before the cutoff time. The cutoff time for California White Wine Trio is 2 PM in the recipient's time zone. Lincourt Steel ChardonnayA cool climate Chardonnay aged entirely in stainless steel tanks for a refreshing, acidic profile. A cool climate Chardonnay that is aged in stainless steel tanks rather than oak barrels, this unique wine has the intense acidity of freshly cut pineapple or a young blood orange. The lack of malolactic fermentation leaves a refreshing concentrated clarity, perfect for pairing with seafood or grilled chicken. A hand selected trio of premium California white wines.